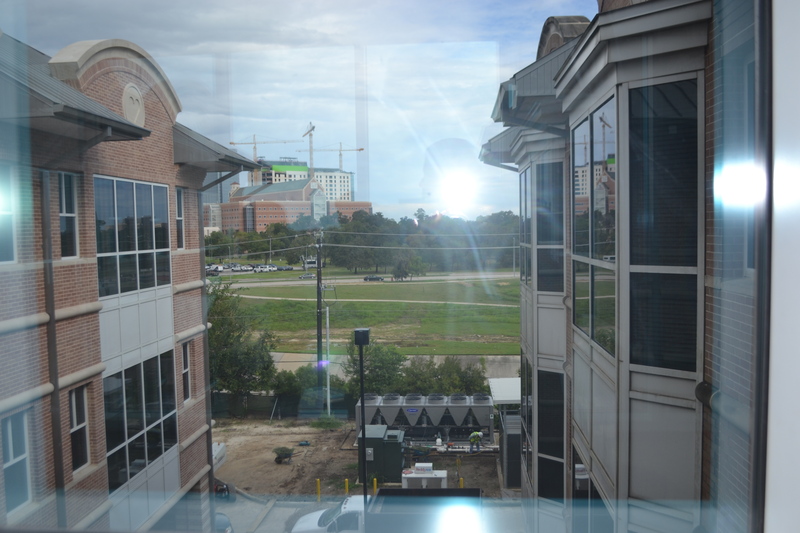 The Ronald McDonald House at the Texas Medical Center has been expanded. HOUSTON – (By Michelle Leigh Smith for Realty News Report) – An adorable 4-year old moved in to Ronald McDonald House Houston at 1907 Holcombe with her parents last week. She looked out the towering window and spied the red, blue and yellow playscape. “Can I please go out now?” she asked. The cheery, family-centric atmosphere has been added 40 percent to their capacity to serve families with seriously ill children, providing seven modern Family Rooms and 20 new guest rooms. Each has two queen size beds, an ironing board, a spacious bath and a sitting area. Thanks to AbbVie Inc., a global biopharmaceutical offshoot of Abbott Laboratories, Ronald McDonald House received $3.5 million to complete their $24.5 million expansion. Houston’s share – the largest single gift in the history of RMH – was part of a $100 million gift to more than 30 Ronald McDonald Houses around the country. Compassion and care are the foundational mortar behind each planning decision, for a resulting state of the art home where everyone smiles. Hugs abound and a noteworthy testament lies in the fact that some guests return for treatments after a number of years, and say it’s like coming home. In 2017, RMH served families from 340 cities worldwide. With the ever-evolving reach of the Texas Medical Center, the RMH Houston’s new CEO believed that they too needed to step up the pace. In 1944, Irving Berlin asked, “What can you do with a general?” in his beloved classic, White Christmas. Major Gen. Rick Noriega, CEO of RMH Houston, found his calling as he took the helm at Ronald McDonald House, a few short weeks before Harvey hit in August 2017, at what turned out to be a propitious pairing. Noriega led resiliency efforts at the request of then Mayor Bill White during Hurricane Katrina in August 2005 after serving two tours in Afghanistan. “When we knew Harvey was coming our way, we pulled out our emergency management plan and went through it line by line,” says Major Gen. Noriega. “We got every employee on board and adjusted plans where needed. I couldn’t be more proud of the 45 employees, the many volunteers, the board members and the entire Ronald McDonald Family. Many of the volunteers stayed here to make sure every need was met.” The staff has grown to total 51 today. “This wasn’t my first rodeo,” said Noriega. The multi-million dollar renovation and expansion of its flagship facility includes a two-story tower and updates to all critical infrastructure, including HVAC, mechanical, electrical and plumbing; plus a lightening and brightening of the first floor and atrium. “We added extra redundancy so the facility would never lose power,” says Jack Bellows, president of W.S. Bellows Construction, general contractor for the expansion. He now leads the company founded by his great grandfather 104 years ago and has worked on the Texas Children’s Hospital, the Houston Zoo and the Center for Conservation at the Museum of Fine Arts Houston. Elsenbrook and Lisa Estes, Chief Advancement Officer, led dignitaries and guests on the opening tour following the ribbon cutting Thursday morning. Dewberry and Wilson Architects contributed the lighter, uplifting design.